The other really fantastic event going on at the Egyptian Theater this past week is the World 3D Film Expo. This is the third event, and it isn’t known if there will be another edition as it is very hard to get these prints. It’s been a rare opportunity to see most of the 3D films made during the classic period when 3D first started in the 1950s, screened in dual 35mm. 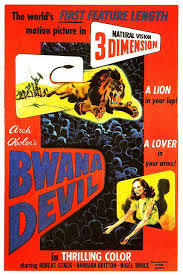 Last week I saw the first feature length 3D film, Bwana Devil. Released in 1952, director Arch Oboler had gone to the major studios with his idea for a 3D feature, but was turned down, so he made it on his own. As I overheard one audience member say, “Not all important films are great, not all great films are important.” This is so true, and Bwana Devil was probably one of the worst movies I have ever seen. The plot follows a railway engineer played by Robert Stack, who has been sent to Africa to supervise the building of his father-in-law’s railroad through the middle of the savannah. However, the locals who have been hired to do the manual labor are wanting to pack out because of the rumors of the existence of a man-eating lion. But Stack’s character pushes on, even after it is revealed that there are two lions. The movie is over-the-top with it’s cheesiness. The “lion attacks” are so fake looking, and everything is set up to exploit the 3D effects. One such memorable shot was a kissing scene between Stack and his wife, played by Barbara Britton. It’s a shot-reverse-shot of their faces coming towards each other, directly to the camera for the 3D. There was plenty of laughing going on during the film, and it’s definitely not a comedy. But the 3D technology really is impressive, especially when you think of what they had to work with back then versus what we have now. Last night’s film was way better. I was also able to meet up with Laura from Laura’s Miscellaneous Musings. It’s always great to be able to see classic films with fellow bloggers. Alan Rode from the Film Noir Foundation introduced the film, which was a treat. 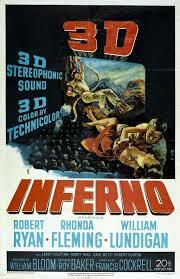 A Roy Ward Baker film from 1953, Inferno starred Robert Ryan, Rhonda Fleming and William Lundigan. Ryan’s character is basically left to die in the middle of the desert with a broken leg, abandoned by his wife and her lover. Most of his movie is his struggle to survive, but it’s also a noir, so there’s the question of if the two lovers will get away with it, and what kind of revenge does Ryan’s character have in mind if he makes it out? Shot in color, the 3D really helps to capture the depth of the desert landscapes, showing the perils of the canyonlands that Ryan has to traverse to find help. There are some gimmicky shots as well, but I thought they were well placed within the narrative, and were actually pretty neat. It’s a really solid, tense film, and I’d definitely recommend watching it even in a 2D version. If you can, there are two more days of the Expo this weekend and I’d definitely try and get down to see some of these films. It’s a rare experience, and who knows when, or if, we’ll get to see these films in this format again. This entry was posted in Uncategorized and tagged Barbara Britton, Bwana Devil, film festiva, Inferno, Rhonda Fleming, Robert Ryan, Robert Stack, William Lundigan, World 3D Film Expo. Bookmark the permalink. It was a really awesome event! That tag line is great, which is more than can be said of the film 🙂 Thanks for reading!